A screenshot from the video of the arrest of Northwestern graduate student Lawrence Crosby in 2015. The video was released publicly after Ald. Brian Miller (9th) requested it at a City Council meeting this week. Evanston officials will present recommendations for changes to police procedures and conduct at a city meeting next month. The proposed changes come after the arrest of Lawrence Crosby, an NU graduate student, in October 2015. A video of Crosby’s arrest was released this week at the request of Ald. Brian Miller (9th). The video shows Crosby being pulled over and punched by police after he was suspected of stealing a car, which was later confirmed to be his own. He was arrested and charged with disobedience to police. The charges were dismissed at trial, and Crosby has since filed a lawsuit against the city. 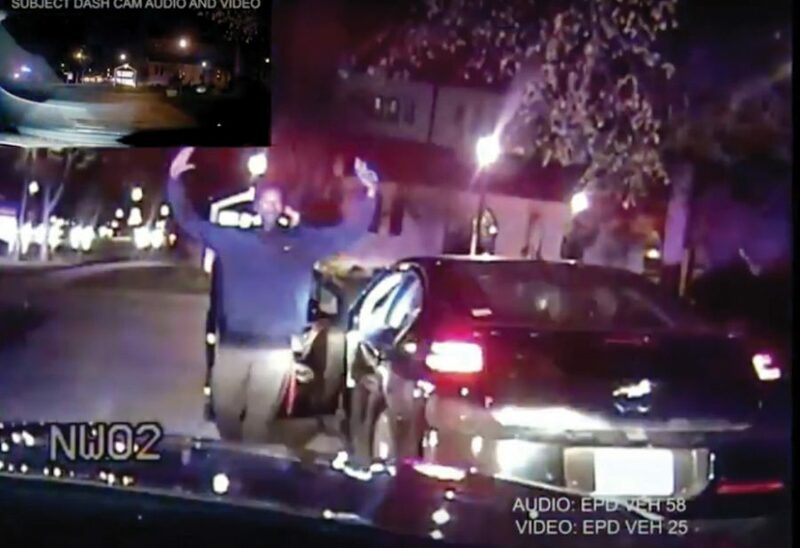 The arrest, which was recorded on video by both police cameras and a dashboard camera in Crosby’s car, spurred the city to consider introducing improved de-escalation training and has become part of a broader dialogue in Human Services Committee meetings, Tisdahl said. Now, the changes are ready to be presented and implemented. Tisdahl said some of the new procedures will include limiting the number of officers who give commands to suspects and no longer requiring that suspects be brought to the ground when they are being arrested. Crosby was recording the incident on his own dashcam. He can be heard informing the officers of this soon after he was taken to the ground in the video. One officer can be heard explaining to the other officer why they were arresting Crosby. “Let’s take him to the station, do whatever ordinance stuff we need to do with him … We’ve got him on camera. We gave him orders,” the officer said. According to court documents, Crosby is suing the city and four officers for malicious prosecution and malice, battery and use of force, failure to prevent battery and use of force, conspiracy and vicarious liability. Crosby’s lawyer, Timothy Touhy, told The Daily he was not in contact with the city about releasing the video. The arrest was a disruption in Crosby’s life and academic career, Touhy said. “The main thing that Lawrence (Crosby) wants is … some accountability, he wants some changes in police procedures for the protection of Northwestern students … people of color, students of color and citizens of Evanston,” he said.